In a nation where most of the population knots together in cities and towns near the coast, nothing says summer holidays like getting out on the water. With Hervey Bay Eco Marine Tours, small groups have the opportunity to feel the wind in their hair, fill their lungs with fresh sea air and taste the salt spray on their lips but with a twist: most of the outings are hosted by local Butchulla guides. Dustyn Currie is one of those tour leaders and claims the title of being a local not only because he’s “spent the majority of my life in Hervey Bay” but because his grandfather was born on K’gari (Fraser Island) and his ancestry dates back to pre-contact. When asked what information he usually conveyed to passengers, he said a wide range of topics might be covered including botany, marine biology and history but in a broad sense, he shared cultural information. He was keen to have open lines of communication so he could share experiences and knowledge that were of interest to the group. “If it’s high tide we can go across to Big Woody Island, go for a walk on this deserted island and see what’s been washed up on the beach,” he said. Owners of the family business Wil and Jacqui Hikuwai said at the beginning of the tours, Dustyn gave guests welcoming words from the Butchulla people. Jacqui said Dustyn told clients, “today we’re family: we look out for each other”. Wil said the guides might share with guests how shells were used to draw patterns with ochre. 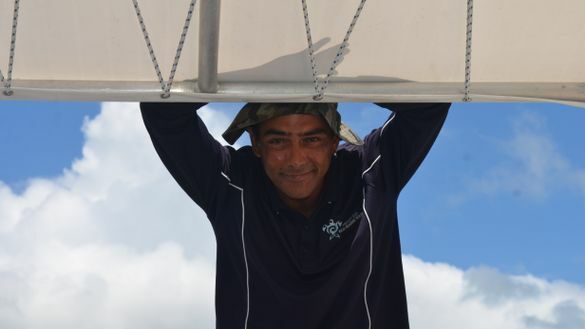 Wil said after more than 25 years working on the water, he and Jacqui had felt there was something missing in the marine tourism sector and the business flowed from there. “We realised there were no indigenous people up and down the coast enrolled in this industry,” Wil said. So their tour group was born in March and while the interest from overseas tourists was always expected, “we seem to have struck a note with the locals”. “I was happily surprised they’re into this cultural aspect,” Wil said, adding that Dustyn always received a round of applause at the end of his tours. Passengers aboard their 12m glass-bottom vessel named Milbi, the Butchulla word for sea turtle, might see a range of ocean creatures from turtles and dolphins to dugongs (the lawn mower of sea, Jacqui calls them) and eagle rays jumping out of the water. And don’t forget the coral, all just outside the marina. Their three main tours are the 90-minute Good Morning Milbi, four-hour Turtle Discovery and Milbi Sunset but they also offer Round Island transfers and private charters. Wil said the first two tours were ideal for children because the vessel was all one level and parents could easily keep an eye on their offspring plus on the longer tour, everyone could get off the boat to explore Pelican Bank or one of the islands in the Great Sandy Strait and go snorkelling if the conditions were right. On weekends and school holidays, guests may also meet some of Wil and Jacqui’s children – Abbey, 21, Mia and Angus, both 15, and Tigerlily, 13, – who help out on board. Sitting on one the Milbi’s timber benches, ahead of the 10.30am tour and musing about his job, Dustyn acknowledged that being a tour guide was work but lowered his voice conspiratorially and added, “I’m cruising around in a boat all day”! For more information, go to herveybayecomarinetours.com.au and visitfrasercoast.com.